Very Good. With CD! A bright, square, and overall a nice copy some highlighting All orders guaranteed and ship within 24 hours. Your purchase supports More Than Words, a nonprofit job training program for youth, empowering youth to take charge of their lives by taking charge of a business. All pages and cover are intact. Spine and/or cover may show signs of wear. Some pages are creased. Page edges are yellowed from age. Some creasing is on the cover. The spine is cocked. ~ Goodwill Industries of Greater Grand Rapids, Inc. is a non-profit organization dedicated to changing lives and communities through the power of work. I really enjoyed the intimate view this book offers into the lives of those in rural China, as well as what it is like to be a peace corps volunteer. 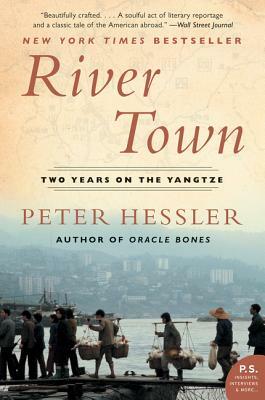 In this book, Hessler offers a window into Chinese culture , history and thought processes. It is an excellent opportunity to understand how the Chinese view the US. Like any good teacher,Hessler gently pushes his students to expand their thought beyond the narrow boundaries of their lives. Hessler describes for us the experience of standing out in a crowd, something we rarely experience here in the US. I enjoyed the book, and would recommend it to anyone wanting to learn more about the foundations of life in China. I felt I was with Peter Hessler during his 2 year sojourn in Sichuan, China. It made me begin to learn to write Mandarin myself and think about dumplings as a separate entity. It was deep and thorough and told through understanding eyes but never forgetting that he wasn't a part of it, he was an American. He was a credit to the U.S. and I admired and envied his experience and often thought about the book when I wasn't even reading it.